This service uses a donation keyword sent to a short-code number for use in the UK. 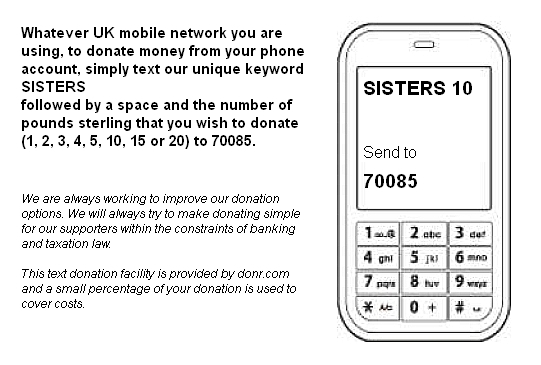 When you make a text donation, it'll either be deducted from your mobile phone credit or added to your mobile phone bill and you won't pay any VAT on your donation. Messages containing only our keyword are processed at a default value of £5. Text donations are subject to your operator's normal charges and bundle management. Please check your operator's terms and conditions before texting. Not all mobile virtual network operators provide for the use of short-codes. Short-codes might need enabling on your service. The text donation service, donr, deducts 5% from your donation to cover the cost of the service. To find out more about that service, visit their website. Click on the illustration to close this browser window.